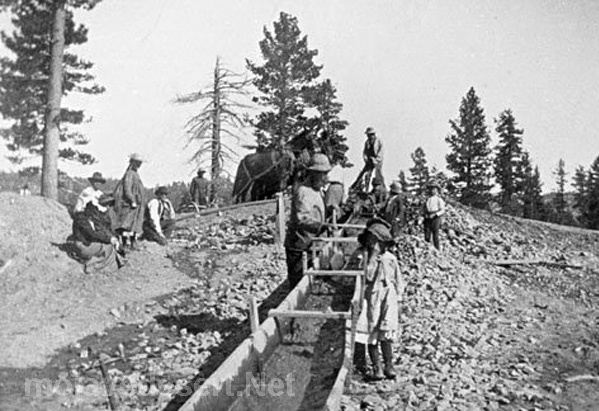 Holcomb Valley, north of Big Bear Lake, was the scene in the biggest gold rush in Southern California history. Actually there were at least three different boom periods in the valley-the early 1860s, the mid-1870s and the 1890s. There has also been considerable mining activity here in the 20th century–including a large mine still operating. Although the area is named for the leading publicist, William F Holcomb, who found a gold vein in 1861, Mormon miners from San Bernardino worked claims in the area at least six years before that. Their activities were well reported in the Los Angeles Star of the 1850s. They did not want a large rush of people to the area, and they got their way, until Holcomb’s loud announcements of his discovery. The main route to the valley was by way of Cajon Pass and across future Victor Valley on what was known as the Van Dusen Road. Thus there was a close tie of the mining area to the Mojave River community. Several early Victor area settlers, including Samuel Rogers and John J Atkinson, were deeply involved in Holcomb Valley before and during their time in the high desert.